These are short notes from a Sunday lunch at Mandarin Oriental organised by the newly-founded Singapore Alsace Wine and Gastronomy Society, helmed by its first President Julian Teoh, on 09 November 2014, featuring the wines of the famous Alsatian estate Domaine Zind-Humbrecht with its proprietor Olivier Humbrecht, MW, in attendance, showcasing Brand (“Land of Fire”), one of the top grand crus of Alsace, located near Turckheim. All the wines of this domaine are biodynamically farmed. 2009 Zind-Humbrecht Riesling Brand Grand Cru Vieilles Vignes. Lifted peaches and tropical fruits, smooth, creamy, slightly austere from the bit of bitter lemon, controlled sweetness, ending in a lasting minty finish. 2008 Zind-Humbrecht Riesling Brand Grand Cru Vieilles Vignes. Deeper than the 2009. Great presence, leans towards sophisticated salty minerality, dry but beautifully layered. Highly complex. Excellent. 2007 Zind-Humbrecht Riesling Brand Grand Cru Vieilles Vignes. Mild green notes, though not vegetal, well-integrated with clear minerality with understated sweetness, giving it a stern demeanour. Became creamier over time but still somewhat short. 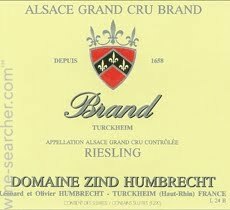 2006 Zind-Humbrecht Riesling Rangen de Thann Clos St Urbain Grand Cru. Arguably from the best grand cru site in Alsace, separate from Brand. Deep luscious gold, distinctly deeper in color with an abundance of apricot and grapefruit but beginning to dry out as evidenced by the lowish alcohol, not helped by the austere minerality. Fleshed out more over time but could do with more fruit. 2009 Zind-Humbrecht Gewurztraminer Clos Windsbuhl. Low in acidity with distinct notes of lychee but unassuming, ending in a long finish. Needs time to unwind. 2001 Zind-Humbrecht Pinot Gris Rangen de Thann Clos St Urbain Grand Cru Selection de Grains Nobles. Luscious with excellent aromatics, highly lifted, lowish in acidity and somewhat dense, displaying excellent complexity, utterly smooth and seamless. Quite exceptional. 2001 Zind-Humbrecht Pinot Gris Clos Jebsal Selection de Grains Nobles. Compared with the Rangen de Thann , this wine is even more layered with apricot and nectar, paradoxically lighter on the palate yet greater in complexity. Marvellous.